LEAP’s cloud infrastructure is maintained by the industry leading cloud platform provider, Amazon Web Services (AWS), in multiple unmarked facilities within the Sydney region. AWS has achieved a substantial amount of certification and compliance in industry standards, which recognise best practices in Information Security. Each LEAP application is accessed via HTTPS using Transport Layer Security (TLS). TLS is a cryptographic protocol designed to protect information transmitted over the internet, against eavesdropping, tampering, and message forgery. Once client data reaches LEAP’s cloud infrastructure, all information is then encrypted at rest, using AES-256, military grade encryption. This is done to protect client information in the event a LEAP server is compromised by an authorised party. All LEAP staff who have direct access to our cloud infrastructure, must go through an extensive vetting process, which includes police background checks, to ensure only bona fide team members are selected to look after our core platform. LEAP has been designed to be a highly available, active-active solution. LEAP services are split over multiple AWS datacentres within the Sydney region. In the event of one data centre going offline in a disaster scenario, the second data centre continues to serve data with minimal, if any, service interruption. LEAP’s service is designed to scale up as more clients use it at peak times, and then scale down at low times. This scaling allows LEAP to mitigate external attacks trying to flood our system resources. The data contained in LEAP remains the property of the licensed subscriber. If the subscriber ends their agreement with LEAP, LEAP will retain the data for a minimum of seven (7) years, before having it destroyed. At any time during the post active subscription, seven (7) year period, a subscription can be reactivated to gain access to the client data. Unless directed by the customer to remove all copies of data, backups of the data may remain in LEAP archives as part of our standard retention policies. LEAP servers are backed up multiple times daily, weekly and monthly. LEAP is monitored 24hours a day, 7 days a week, 365 days a year. At LEAP, we strive to have the most secure solution we can. If you believe you’ve found a security vulnerability in our platform, please let us know on secure at leap.com.au. If you believe LEAP client information has become publicly available, outside of LEAP, please contact us immediately on secure at leap.com.au for validation. LEAP has a duty of care of our client’s data. If a data breach occurs, we must notify affected clients immediately. 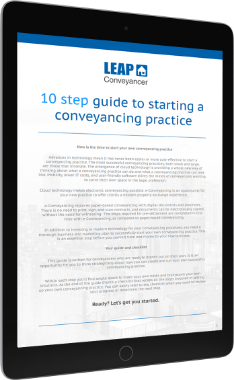 Now is the time to start your own conveyancing practice. conveyancing practice in your inbox. Complete the form below and a Product Consultant will be in touch.